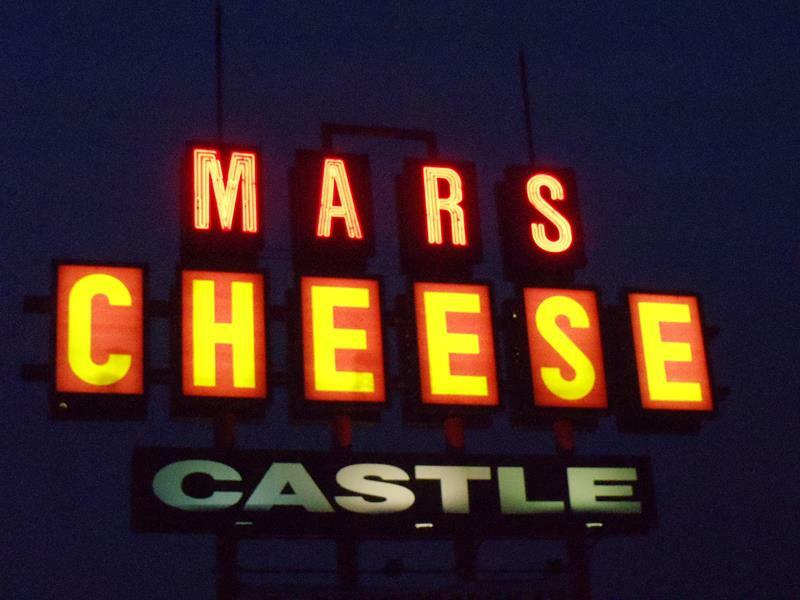 One of our favorite places that just screams “Wisconsin!” is the Mars Cheese Castle. This Wisconsin cheese shop, deli, bar, bakery and more is popular purveyor of cheeses, meats, hot sauce, bakery, and Wisconsin kick-knacks is a widely recognized landmark on the busy Milwaukee-Chicago corridor, with its iconic sign beckoning travelers. Its new building, completed in 2011, finally makes it look like a castle. It didn’t for its first six decades. 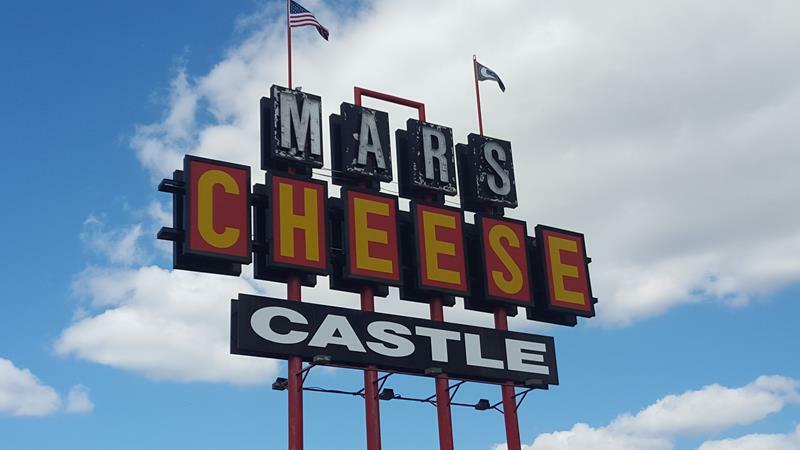 Originally opened in 1947 along U.S. 41 and what was Wisconsin Highway 43 (today’s 142), the Mars Cheese Castle catered to travelers in search of a variety of cheeses and other local foods as they entered or left the state. Still a family business, Mario Ventura, Sr. started it up and added on as they could: a deli counter, a sandwich shop, a bakery, a bar, a gift shop… all of these were tacked on to the original building. 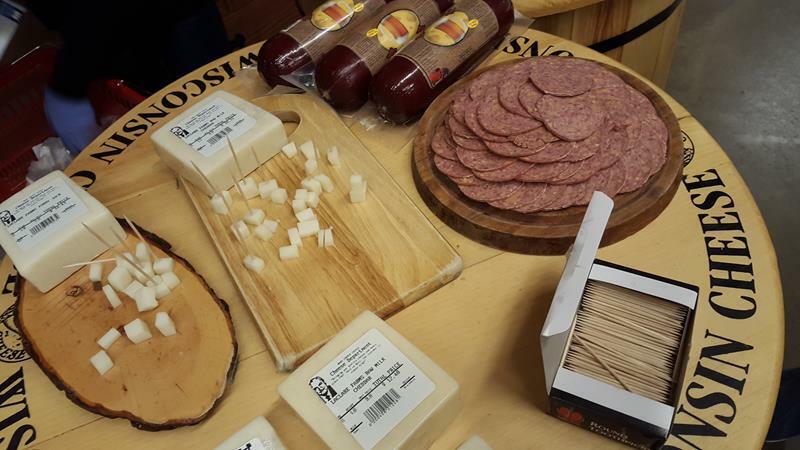 He and partners built not only a successful travel stop, but a brisk mail-order and later online business, shipping cheese, sausage and other products from Wisconsin to locales all over the country. Their home brand of spreadable cheese is called “King of Clubs”, and a large tub of it with Town House crackers are available for enjoyment at the bar at all times. Their deli offers an amazing selection of cheeses, sausages, crackers, and other enjoyable consumables; their wine and beer selection is extensive, their gift shop offers every Wisconsin-y thing you could imagine, their market and bakery offers everything from tons of hot sauce selections to kringle; and a State Trunk Tour favorite is a summer sausage sandwich from the deli. 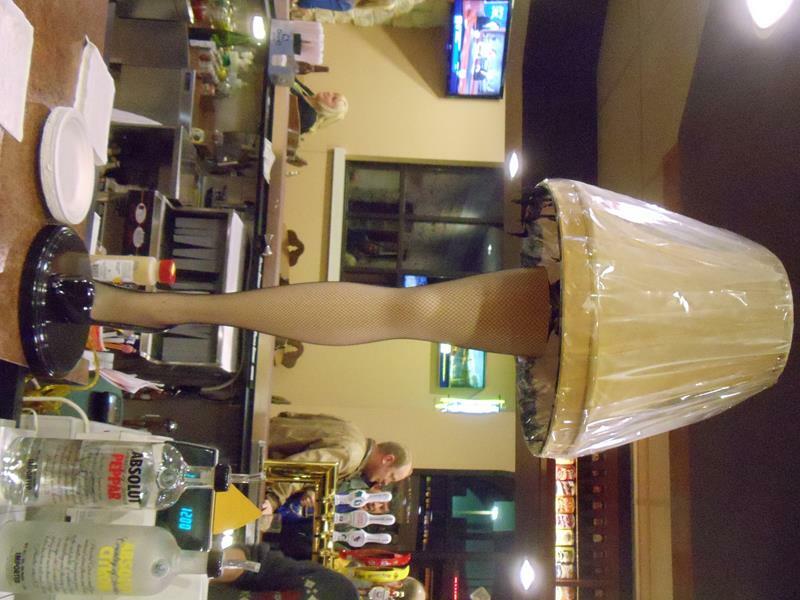 The bar even has a “leg lamp” – the kind popularized in the movie A Christmas Story – to add to the atmosphere… the lamps are crafted in Kenosha, after all. 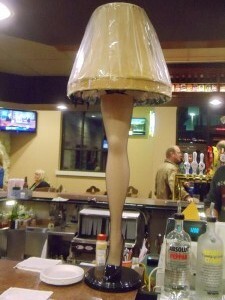 The Mars Cheese Castle’s bar features a coveted “leg lamp,” just like Ralphie and the Old Man liked. When I-94/U.S. 41 reconstruction began between Milwaukee and Chicago, it was determined Mars had to move to accommodate the new footprint of the freeway’s interchange with Highway 142. 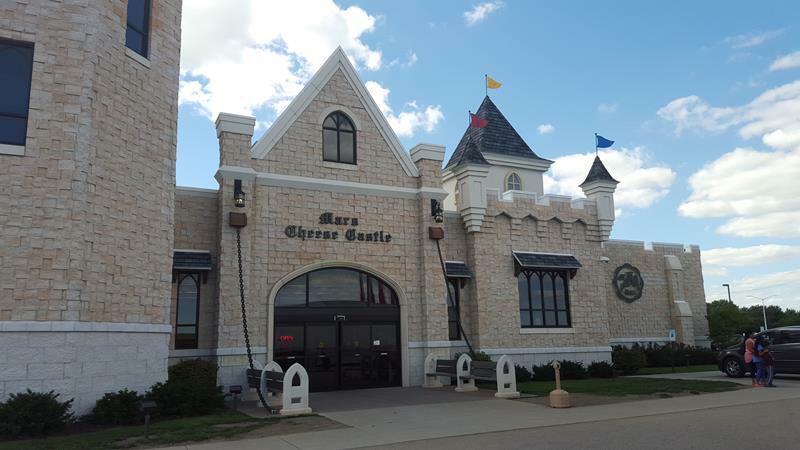 The new building opened in 2011 and finally resembles a castle on the outside and all the “regions of Mars” – if you will – are more easily accessible than they were in the original building. 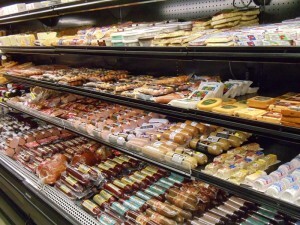 It’s still one of our favorite Wisconsin cheese shops. One Response to "Mars Cheese Castle"
Their Bloody Mary goes great with a summer sausage sandwich, too!